As the global psychiatric community enters a new era of transformation, this book explores lessons learned from previous efforts with the goal of “getting it right” this time. 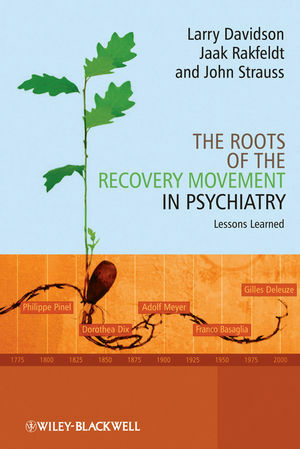 In response to the common refrain that we know about and ‘do’ recovery already, the authors set the recovery movement within the conceptual framework of major thinkers and achievers in the history of psychiatry, such as Philippe Pinel, Dorothea Dix, Adolf Meyer, Harry Stack Sullivan, and Franco Basaglia. The book reaches beyond the usual boundaries of psychiatry to incorporate lessons from related fields, such as psychology, sociology, social welfare, philosophy, political economic theory, and civil rights. From Jane Addams and the Settlement House movement to Martin Luther King, Jr., and Gilles Deleuze, this book identifies the less well-known and less visible dimensions of the recovery concept and movement that underlie concrete clinical practice. In addition, the authors highlight the limitations of previous efforts to reform and transform mental health practice, such as the de-institutionalization movement begun in the 1950s, in the hope that the field will not have to repeat these same mistakes. Their thoughtful analysis and valuable advice will benefit people in recovery, their loved ones, the practitioners who serve them, and society at large. Larry Davidson is Associate Professor of psychiatry at the Connecticut Mental Health Center at Yale. His patient-oriented research includes recovery from serious mental illness, the development of qualitative and participatory research methods, community-based treatment of psychosis, the development and evaluation of innovative psycho-social interventions, and the promotion of collaborative relationships between people with serious mental illness and their healthcare providers. He received the President's Award, United States Psychosocial Rehabilitation Association, New York Chapter, in 2007 and the Franco Basaglia Memorial Scholarship, Fondazione Basaglia, Rome, Italy, in 2008. Jaak Rakfeldt is Professor of Social Work at the Southern Connecticut State University in New Haven, CT, USA. John Strauss is Emeritus Professor of Psychiatry the Department of Psychiatry at Yale University in New Haven, CT, USA. 1.1 What is the recovery movement in psychiatry? 1.9 Why these figures and not others? 2.6 Moral treatment or moral management? 6.3 Can rights be given?